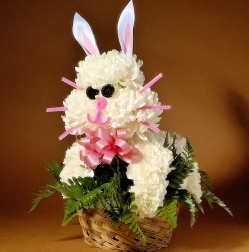 Learn to make bunny rabbits out of flowers with this eBooklet. This is an electronic file you can download and print out on your own computer at home. No waiting for it to arrive in the mail. DOWNLOAD INSTANTLY FROM CONFIRMATION EMAIL AFTER YOU PURCHASE THIS HOW-TO BOOKLET! Includes instructions on how to make a florist bow. All "How-to" booklets include a complete supply list with instructions on how to use the floral supply, how to make eyes, ears, noses, mouths, whiskers and bows. Patterns are also included for ears for flower puppies and flower bunnies. All "how-to" booklets include step-by-step instructions with photos illustrating each step.